I was looking over used guitars on the Guitar Center website and saw a Japanese Les Paul copy talked about in here once in a while. I remember seeing one in a local pawn shop here in Maine when I was a young 16 yr old in the mid 80s. I saw it selling for $199 with hard case, don’t know if original case or not, so I said what the heck. If you don’t know me I do some luthier work so this may be a fun resto. Someone already replaced the pickups and tuners ... to what, who the heck knows. The guitar ad only had 2 pictures, these are they. I searched Reverb and saw three listed for $400 and up and surprised because usually a bolt on goes for cheaps. Looks like a piece of binding missing on the back side at the neck joint plus plenty of dings and chips. I’m hoping for a neat fun guitar with 40 yrs of relic. The headstock has chips and dents, doesn’t look like any cracks etc. Questions I have are easy ones like .... is the truss rod still trussin’ and do I need to do a refret etc. Anyway, when it arrives I’ll post up the photos and what needs to be done. Preceded by a touch of reverse delay. These guitars somehow always get my attention too. That price is right, and if it's a "challenge", all the more fun. You'll have a real player on your hands when it's done. I hope we didn’t pay twice. I’m hoping for a decent player ... we shall see! The price was right ... it’s 40+ yrs old. Some of them a real doozies and not worth much. $199 is the right price for this bolt-on one but don't expect the Holy Grail of guitars there. 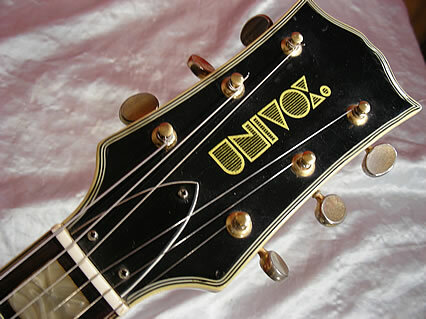 The headstock logo, alone, is worth most of that price. Sounds like a fun project for you. Be sure to update us as you go. I always enjoy seeing those threads. You're not kidding. So 70's. Totally took a virtually unseen chance on it ... $200 isn't a lot of money. I'll make it work ... pretty much anything can be fixed. I'll know more when I pull the pickups out and have a look see. Interestingly we recently got a white Ibanez that someone had changed the pickups in and there were two DiMarzio Steve Vai models in it. I like it when someone changes the pickups for something good and not some mediocre stuff. If these pickups are so so I have a Seymour Duncan Pearly gates bridge pickup here that is ironically very reliced naturally. I'm sure it needs work ... recently bought plenty of fret wire sets should it need it. I'm more interested in the truss rod working properly more than anything else.